Xtra-Duty designs provide instant access control and front-line security, while ensuring line-of-sight visibility and air circulation. The gates are reinforced with at least two rows of lattice bars. 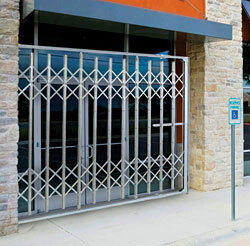 They have twice the weight of steel found in the standard heavier-duty folding gates, improving durability and security. Gates are available in single- and double-gate configurations. These units feature folding top and bottom tracks that create a sturdy blockade from unwanted access when expanded.